Trailhead is on Rt. 25A in Orford, NH. It is on the south side of the road, 4.6 miles west of Rt. 25/118 and 9.9 miles east of Rt. 10. Park on the roadside. Mt. Cube is one of the mountains traversed by the Appalachian trail in the section south of the White Mountains. Long-distance views are found from its two ledgy peaks. It is best approached for a day hike from the north, going south on the AT. From the trailhead, the trail crosses a brushy stream, starts out with a short ascent, and then becomes more gradual as it climbs through the forest. It crosses an old road after half a mile, then angles across the mountainside, making many short rises and falls. It crosses several brooks, making a minor descent at each, before making a long switchback descent and crossing one final brook in just over a mile from the gravel road. The trail then heads straight uphill, becoming moderately steep. After ascending for a while, it turns and begins switchbacking uphill over a rockier surface. Steep stretches now alternate with short flat places. It climbs wooden steps, passes a tree whose roots completely engulf a boulder, then becomes flat again near the top of the mountain after 1.5 miles of climbing from the brook. At the trail junction, turn left to make one final climb to the summit of Mt. Cube. At the top are wide areas of pretty ledges, made of a rock called quartzite, a type of compact quartz. 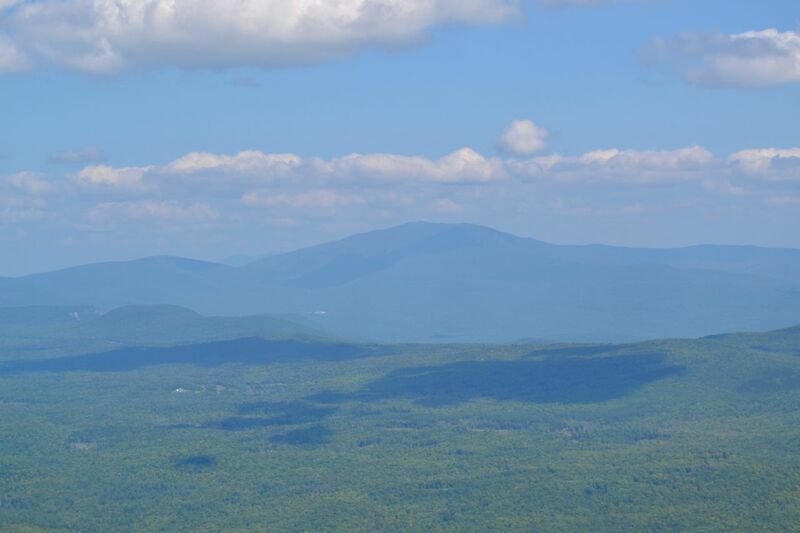 From these expansive ledges, views extend a great distance into southern NH and eastern Vermont. Many small hills and towns are seen in the flat areas of Vermont, while mountains dominate in the NH view. In the distance are Mt. Cardigan, Mt. Kearsarge, and Croydon Peak, but the most noticeable feature is the massive wooded ridge of nearby Smarts Mountain. If you look closely, you can spot its fire tower. After enjoying these great views, many hikers return home, unfortunately missing what is possibly the most exciting part of the hike. Return to the junction, and continue straight across (passing your ascent route on the right) onto North Cube Side Trail. This short spur path leads 0.3 miles across the ledges to the open north peak, where there are wide views over the countryside to the north. In the center of the view is lofty Mt. Moosilauke, seen over Upper Baker Pond. Far to the west is Piermont Mountain, with the Benton Range in the distance. Cliff-faced little Webster Slide Mountain is seen under Moosilauke, with Mt. Clough above. To the east of Moosilauke, many of the high White Mountain peaks can be found, including Mt. Osceola, in the center. Off to the east is the long ridge of Carr Mountain. You may want to spend more time here, as you are likely to find it far less crowded than the summit of Mt. Cube.